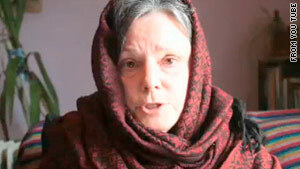 Nora Shourd asks for the hikers' release in a video directed at Iran's supreme leader. It's posted on YouTube. (CNN) -- A mother pleaded Friday with Iran's supreme leader to release her daughter and two other hikers detained in that country since July. The videotaped message from Nora Shourd, mother of American hiker Sarah Shourd, 31, comes a week before Christmas. The appeal is directed toward Ayatollah Ali Khamenei. "This time of year is one of spiritual reflection and prayer for all the faiths of the family of Abraham, each in their own way. It's a time of year when families come together. This human value unites us as children of God, who is most merciful and compassionate," Shourd says in the video. According to the hikers' families, the trio accidentally strayed across an unmarked border intoIran while on a hiking trip in Iraq's Kurdistan region. They are being held on espionage charges after being detained on July 31. On Monday, Iranian Foreign Minister Manouchehr Mottaki said the young people will be put on trial. The other hikers are Shane Bauer and Josh Fattal, both 27. "If they entered Iran, it was an innocent mistake, and I deeply apologize and regret any inconvenience their actions may have caused," Nora Shourd said. "As Sarah's mother, and on behalf of the mothers of Shane and Josh, I respectfully apologize and request your benevolence at this time of year." Shourd delivers her message while wearing a black and red hijab. The room behind her is plain with a radiator, plant and bed or sofa with a striped cover. The videotaped plea is posted on the Web site dedicated to the hikers, freethehikers.org, and on YouTube. According to the families' Web site, a copy of the video, with Farsi subtitles, was sent to the Iranian Mission to the United Nations in New York. It was accompanied by a petition signed by more than 6,300 people calling for the hikers' release. The Americans are being held at Evin Prison in Tehran. Shourd points out that an American mother's love for her child is the same emotion an Iranian mother would feel. After hearing the three would be tried, U.S. Secretary of State Hillary Clinton said Monday, "We consider this a totally unfounded charge. There is no basis for it. "The three young people who were detained by the Iranians have absolutely no connection with any kind of action against the Iranian state or government. In fact, they were out hiking, and unfortunately, apparently, allegedly walked across an unmarked boundary." The United States, which has not had diplomatic relations with Iran since 1979, has relied on Switzerland to appeal directly for the hikers' release. A Swiss diplomat has met twice with the Americans in their Iranian prison. Nora Shourd said the three youths "meant no harm to the Islamic Republic of Iran and have a deep respect for your ancient and noble civilization." She closes the video, by saying, "Please release our children and return them home to us. Nothing in the world would bring us greater joy."